Once our first case study about soil had ended, kindergartners and first graders were excited and energized about what they would be learning next. 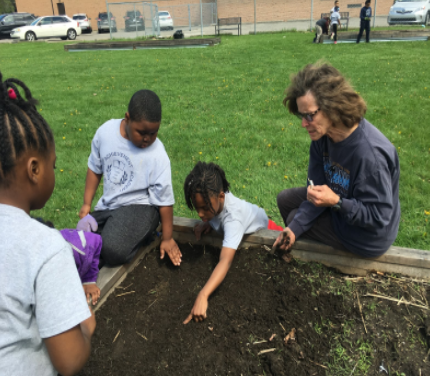 As students gained an understanding of the importance of soil for the growing process of a plant, they were motivated to learn more. We spent the next couple of weeks learning about plants—plant parts, plant part jobs, plant needs, and the life cycle of a plant. Students learned the scientific terms and content through songs, drawings, videos, and observations! Students realized we had 5 beautiful garden beds outside of our school built to raise crops. They proposed planting seeds in the gardens to watch their seeds grow into seedlings, sprouts, and mature crops (terms they have learned throughout our expedition). We determined it would be really neat to observe and document crops’ growth over time. The only problem: we didn’t know the first thing about gardening. We enlisted a local gardening expert, Ms. Billie Hickey, to teach us the ins and outs of gardening and how to take care of our crops, so we could become successful gardeners our own. 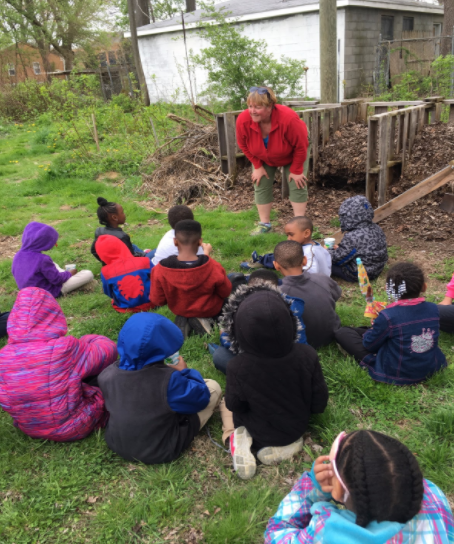 Students took a trip to Billie’s garden in nearby Brightmoor, where she showed us the many different crops she grows and explained how she cares for them. Watching and listening to Ms. Billie encouraged students to think about how they could become expert gardeners at our school! When we came back to school that afternoon, we realized it was hard for us and other visitors to know which crops were growing where in Billie’s garden. We also had a difficult time knowing whether if we were walking on crops that hadn’t started growing yet! Because we had read several books about gardening, students realized Ms. Billie didn’t have any crop markers in her garden! We decided we were going to help Ms. Billie improve her garden for future visitors. We would create plant crop markers so Ms. Billie and visitors would know which crops are in the garden. We decided we would also make these markers for our DAA garden! The authenticity piece of for our high quality final product couldn’t have been more apparent! Students are now in the process of creating a two-sided plant marker: one side included a scientific drawing of a crop (for which they are becoming experts) with its care instructions on the other. Students will share their plant markers with their families at our Celebration of Learning in our DAA garden, before giving them to Ms. Billie for her garden. Students’ drive to complete their writing and revise their scientific drawings is really strong. Knowing their finished product will help a leader and expert in our community keeps the students motivated and energized!